As a business, you probably have commercial refrigeration requirements that far exceed what anyone needs in their home. At Robaire Company, Inc., we excel at helping businesses with their refrigeration needs in Bucks County and beyond. In business since 1985, our HVAC&R technicians are licensed and bonded to do maintenance, repair and installation work on your company’s refrigeration units. We have the knowledge and experience to service all makes and models, and we bring this experience to every job we get. Based in Levittown, our trained technicians can quickly reach your business in Newtown, Yardley, Doylestown, New Hope, Warminster and any of a number of other cities and towns in and around Bucks County. In fact, we serve the entire Delaware Valley, and our technicians are licensed to work in Pennsylvania, Delaware and New Jersey. At Robaire Company, Inc., we know that problems with your commercial refrigerators do not always strike at convenient times. This is why we are available 24 hours a day and 7 days a week to handle any emergencies you may have. We know that if your refrigeration fails that means lost food or other product stock and lost money for your business. We’ll do everything we can to prevent that. 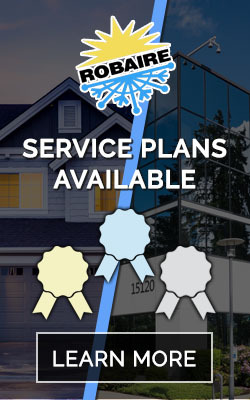 Whether your home or business uses a furnace, boiler, heat pump or other system, we have the training and experience to maintain, repair or replace it. The heat can get pretty bad in the summer in Bucks County, and you don’t want your family to be uncomfortable if your home unit fails or to lose customers if your business cooling fails. We can set up your home so that you can remotely manage your lights, door locks, thermostat and a number of other systems with your smartphone while you’re away. As mentioned above, our experienced contractors know how to service and maintain all types of commercial refrigeration to keep you from losing valuable stock. Boilers require periodic maintenance to operate at maximum efficiency, and if yours needs fixing or replacing, we’re familiar with all makes and models.